Educational websites are an excellent way of providing useful information to students. Learning online is fun and more interesting compared to the boring traditional classroom system of learning. Many websites and mobile application provide interactive learning classes at the comfort of sitting in your home. The convenient and flexible online way of learning helps students to cut the higher tuition fees. 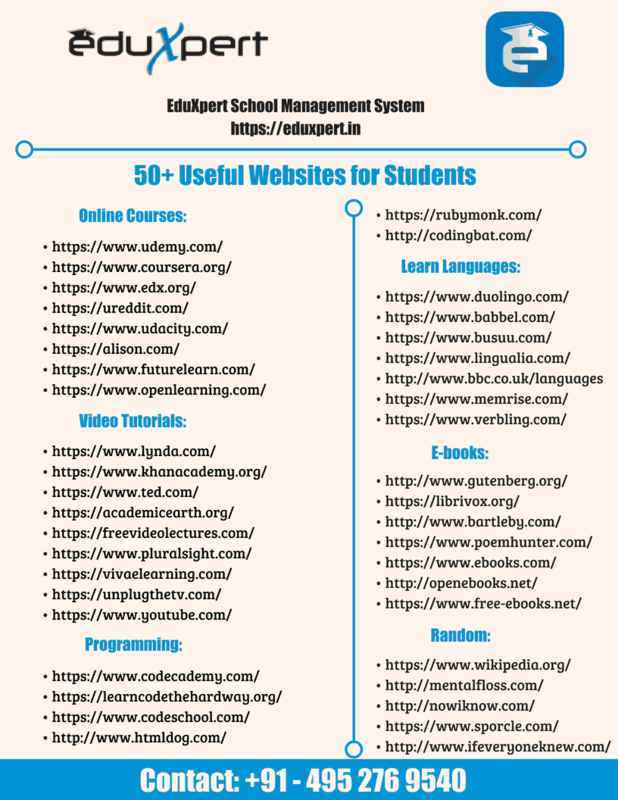 Here is a look at the most useful List of educational websites for students. Online Courses are totally worth the effort. Though it has it’s own limitation, the advantages of online courses overcome it. The wide availability of courses, lesser fee in comparison with the traditional learning, duration of courses and of course its flexibility and comfort makes it by far the most preferred way of learning. Videos are a very effective way of learning. Learning through visuals make a student grasp, understand and remember the subject easier. Here are some websites that can be used for finding useful video tutorials. Learning a language through online websites seems new for many. but it is one of the most effective ways of learning languages. many language training websites provide you interactive lessons with native speakers. It helps to learn language easily and effectively. Here are the websites that you can use for learning a language. Verbling – The Modern Way to Learn a Language. E-books are a popular way of learning. Find ebooks using the below-listed websites. Learn how to make anything in the world using DIY/How to websites. These websites provide amazing tutorials about DIY maker creations. Hope you found the list useful. Have a good day! Thanks for sharing useful post regarding Free lists of Educational sites are very helpful Thanks for sharing . I will definitely be coming back here more often.Thanks a lot for taking your time to share this amazing post with us. At the same time All of the posts on your blog are having informative and valuable content. Once again thanks for putting out such content.